As the month of October begins to dwindle down, many people look forward to the Halloween festivities at the end of the month, while also trying to enjoy the last remnants of fall before winter hits. In the middle of all this, a very important day has often times been overlooked. This day is National Make A Difference Day, which falls on October 28 this year. National Make A Difference day has been celebrated annually on the fourth Saturday in October since its establishment in 1992. National Make A Difference Day was adapted from the National Day of Service, which was held every leap year. This event was established as a day to promote the idea of volunteering as a positive and heartwarming event, while also trying to portray the impact that volunteering can have within one’s own community. While serving, it does not matter what race, ethnicity, or religious background you may come from. The main emphasis, rather, is that this is a day where individuals may come together and serve within their own community. Supported by the TEGNA Corporation, Points of Light, and Arby’s Foundation, National Make A Difference Day has been deemed as one of the largest single days of service both globally and stateside. While this movement originally began in the United States, National Make A Difference Day is also being recognized in about 30 different countries, and its organizers are looking to expand into more. There are many ways to get involved with this movement. One can start their own project such as a recycling event, a food drive, a 5k benefit run, or simply taking a group of volunteers to serve within local homeless shelters in their communities. If one is interested in organizing an event, there is an opportunity to win a 10,000 dollar grant to further a mission or project of their choice. While leading an event is one big way to make an impact within this movement, another way to contribute is through volunteering at an already-established project within their community. One can also spread awareness about National Make A Difference Day and learn about other service projects going on by searching the hashtag #MDDAY on social media. The list of possible ways to get involved is endless! Whether leading an event or volunteering at one, an individual’s contribution to National Make A Difference Day can be of great value. As long as people are volunteering, they are fulfilling the main goal of National Make A Difference Day. 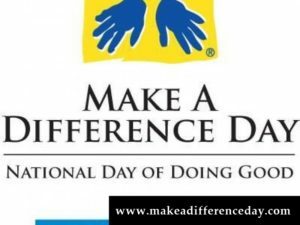 Why Celebrate National Make A Difference Day? There are many reasons to consider volunteering your time and effort to a local National Make A Difference Day event within your area. According to the National Make A Difference Day website, the annual net value of the 30-million-plus volunteer hours documented would be worth about $635 million (Make A Difference Day). Volunteering is impactful for the community and can inspire others to want to volunteer. It can also help change the view of volunteering from an obligation to a privilege, helping us become a society that embraces the ideals of volunteerism. 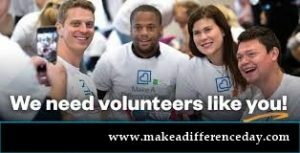 National Make A Difference Day is dedicated to improving the lives of others, while also providing the tools and resources necessary to people who want to maximize their volunteer efforts to the fullest. It is a day where people strive to help others, without expecting anything back in return. Women At Risk International (WAR, Int’l) understands the impact of volunteering. Within our organization, there are numerous opportunities where you can make a difference. Here at our headquarters, we rely on volunteers for many things. Even seemingly small tasks, such as tagging products or preparing mailings, make a big difference: having volunteers perform these tasks saves us tens of thousands of dollars each year. Others volunteer to work in our boutiques or offer creative skills such as writing, photography, or graphic design. 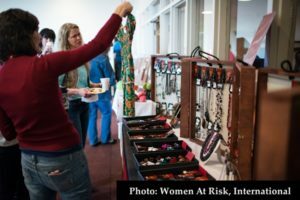 No matter where you live, you could host a party or event which promotes awareness of WAR, Intl’s mission and supports at-risk women by selling their product. Whatever your contribution may be, your time is desired in order to make a difference for at-risk women throughout the world. It is essential that those who choose to volunteer are recognized and appreciated, because every little contribution makes a big difference. All of us at WAR, Int’l would like to thank those who have wholeheartedly volunteered and dedicated their time to our missions and goals. As an organization, we hope and trust that we will continue to receive as much love and support from our volunteers to make a difference as we continue to fight for the freedom and safety for these women.